Chocolate Mint Shortbreads take two buttery and crisp chocolate shortbreads and sandwich them together with a smooth and creamy dark chocolate ganache that has been flavored with peppermint. I really like the contrast of flavors in these cookies - how the mint's cool yet warming sweet flavor pairs with the dark chocolate both in the ganache and the cookie. You will find that when you first assemble these sandwich cookies the flavors of the chocolate shortbreads and chocolate mint ganache remain separate. 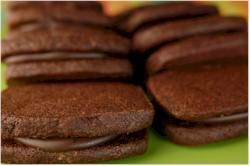 Yet after being stored a day or two the mint flavor starts to permeate into the chocolate shortbreads to make one delicious tasting sandwich cookie that is perfect for the Christmas season. Chocolate shortbreads, like all shortbreads, have butter as their main ingredient. Therefore it is important to use a good quality butter. You can use either salted or unsalted. Although if you use salted butter you may want to leave out or reduce the salt in the recipe. Besides butter, vanilla extract and cocoa powder also share the stage in these cookies. Buying vanilla extract can be a challenge as there are so many choices. The first thing to do is to make sure that it is labeled "pure". Stay away from the ones labeled "imitation" vanilla extracts as they are made with synthetic vanilla and leave a bitter aftertaste. Lastly, the cocoa powder. There are two types of unsweetened cocoa powder, Dutch-processed and unsweetened "natural" cocoa powder and you can use either one in this recipe. Once the shortbread batter is made we divide the dough in half and shape each half into a log shape. At this point the logs can be chilled in the refrigerator for up to three days or the logs can be frozen for a couple of months (defrost the logs in the refrigerator overnight). This is the same method used for Refrigerator or Icebox Cookies. What's so nice about this is that you can slice and bake as many cookies as you want. The chocolate shortbreads are filled with a mint flavored ganache. Ganache is simply a mixture of chocolate (can use bittersweet or semi sweet chocolate) and heavy cream (cream with a 35-40% butterfat content). You can add either pure peppermint extract or peppermint oil for the mint flavor. If you have any leftover ganache you can use it to make truffles. Just chill the ganache until firm, form into small balls, and roll in cocoa powder. Chocolate Shortbread: In a bowl, sift or whisk together the flour, cocoa powder, and salt. In the bowl of your electric mixer (or with a hand mixer), beat the butter and sugar until smooth. Beat in the vanilla extract. Add the flour mixture to the butter and sugar mixture and beat just until a dough forms. Preheat oven to 325 degrees F (165 degrees C) with the rack in the center of the oven. Line two baking sheets with parchment paper. Using a sharp knife, slice the logs into 1/4 inch (.5 cm) thick cookies. Place the cookies on the prepared baking sheets, spacing about 2 inches (5 cm) apart. Bake for about 15 -18 minutes, or until the cookies are dry and firm to the touch. Remove from oven and cool completely on a wire rack. Chocolate Mint Ganache: Meanwhile, place the chopped chocolate in a small bowl. Place the cream in a small saucepan over medium heat and bring just to a boil (you can also do this step in the microwave). Immediately pour the boiling cream over the chocolate. Let the chocolate sit for a few minutes then stir to combine. Stir in the peppermint extract. Set aside to let the ganache completely cool and become thick enough to spread, about two hours. To Assemble Cookies: Take one chocolate shortbread and spread a small tablespoon of the ganache on the flat side of the cookie. Top with a second shortbread, flat side down, and press gently so the ganache spreads to the edges of the sandwich cookie. Repeat with the remaining shortbread cookies. Can be stored in a container at room temperature for several days or they can be frozen. Makes about 30 sandwich cookies.